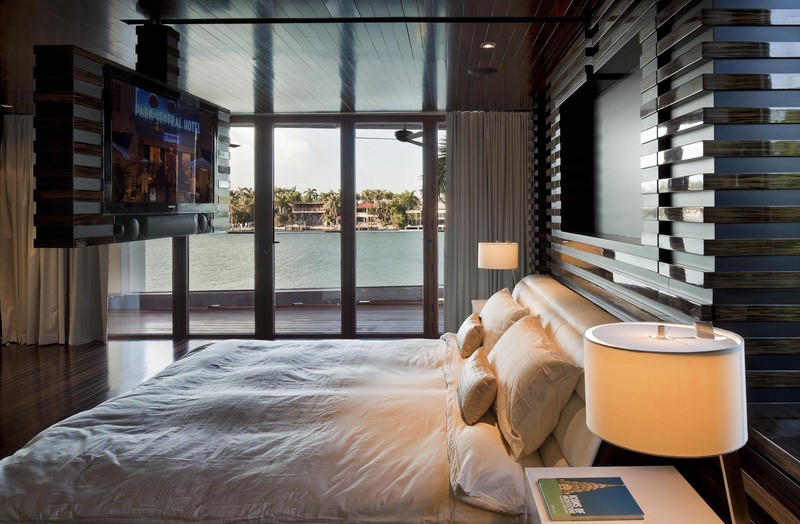 Arguably one of the most important new landmarks of residential design in Miami Beach, the 4,700-square-foot home of Hassan Jalali is a striking statement, clearly inspired by the nautical surroundings. 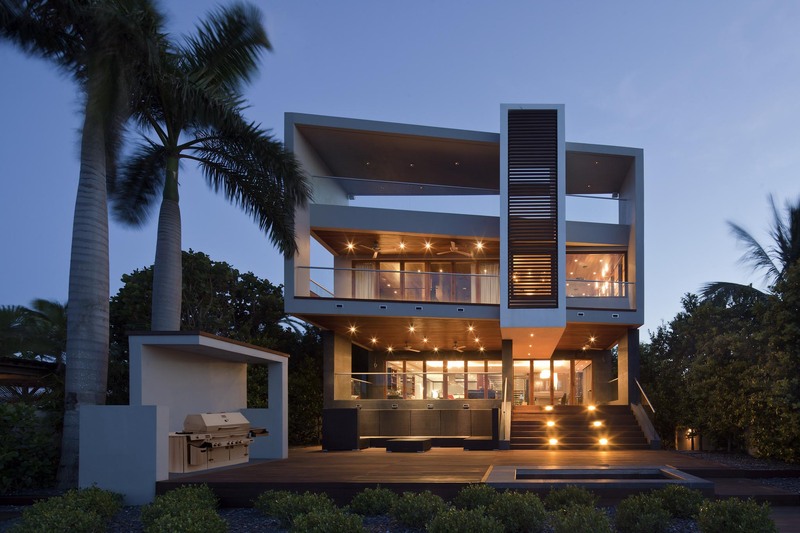 It is built well, reflecting the fact that the homeowner also runs a large construction company. Yet is also reflects the internationally acclaimed work of architect Reinaldo Borges, AIA, NCARB, principal of Miami’s Borges & Associates, who was design director for Morris Architects before starting his successful practice. Borges is known for big moves – like the heroic rectangular frame that envelopes the house, and the memorable glass-treaded staircase within. The architect partnered with Jalali on the interiors – with help from Miami’s celebrity designer, Mark Diaz – and the team chose NanaWall SL73 Aluminum Framed Thermally Broken Hurricane Approved Folding System in the living room and master bedroom to increase the connection between the living experience and the waterside ambiance of Biscayne Bay. 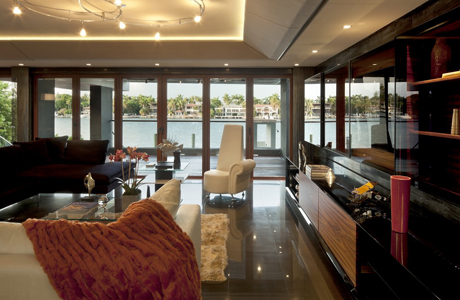 The kitchen and billiards area also open completely to the water. 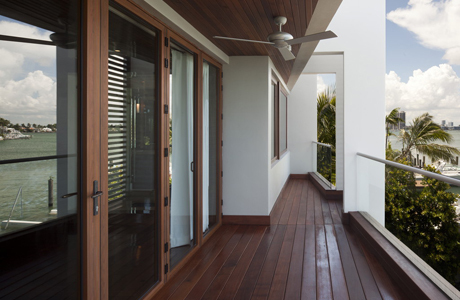 The choice of NanaWall was ideal for the house, the rigorous engineering and flawless construction of the four openings was an ideal match for the crisp detailing of the project. The master bedroom has a low-key and relaxed feel, as the team intended, but it spans the width of the entire home – and the NanaWall opening spans a large portion of the wall, too, alongside a large picture window. Again, it’s a heroic gesture, and in this case one that the architect could achieve in a hurricane-rated configuration, with NanaWall’s SL73 system. 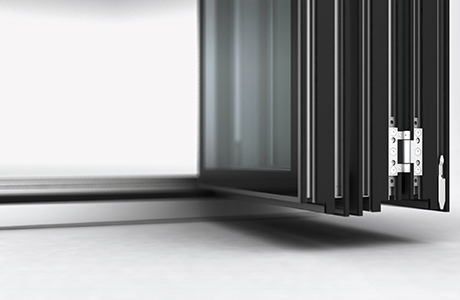 In fact, the NanaWall SL73 is the first folding wall system with Miami/Dade and AAMA Hurricane certification, suitable for low- and mid-rise structures. NanaWall Systems has obtained Miami-Dade County NOA approval No. 11-1024.04 for the inswing and 11-1024.05 for the outswing for the NanaWall SL73. The visual drama continues in several other quarters of the house. 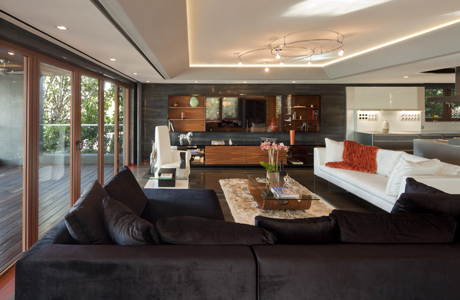 Opaque sections of the modern, squared-off composition yield to glass on the main façades, and several feature the wood-grain finish NanaWall SL73: the kitchen, with its ultramodern furnishings and stainless-steel finishes; the sleek, Jetsons-esque living area; and in the billiards room opposite the living room. On the main floor, in fact, almost the entire wall – a residential storefront, really – completely opens to the bay. The wood-look finishes on the aluminum framing of the NanaWall system is an essential part of the design scheme: To create comfort and ease while testing the proverbial waters of tropical high modernism. The scenery also becomes one with the interior experience, Jalali has said, which further “warms up” the experience – thanks to NanaWall’s broad glass openings.